So long to the injection season: net storage withrawals from storage have begun. 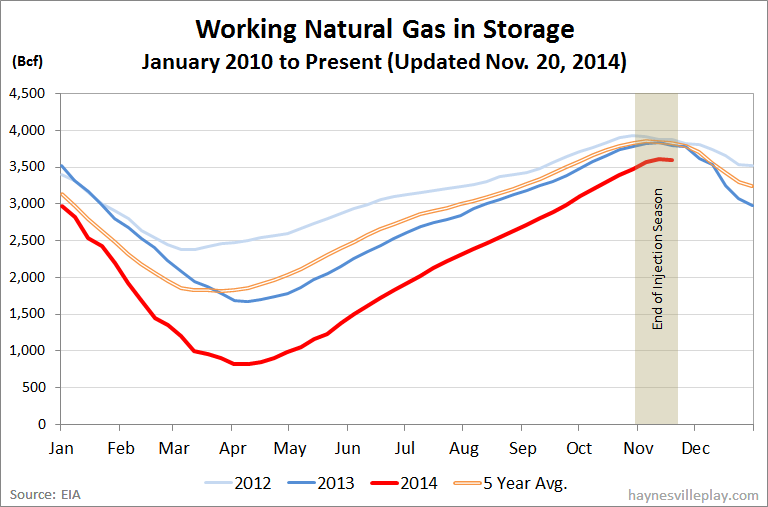 The EIA announced this morning that working gas in storage was down 17 Bcf to 3.594 Tcf. The weekly withdrawal was half of last year's (-36 Bcf) but 7 Bcf higher than the five year average (-10 Bcf). The current storage level is now 5.3% below last year (3.795 Tcf, a difference of 201 Bcf) and 6.4% below the five year average (3.838 Tcf, a difference of 244 Bcf). Temperatures in the Lower 48 last week averaged 46.4 degrees, which was in line with the weather this week last year and 1.3 degrees cooler than average.